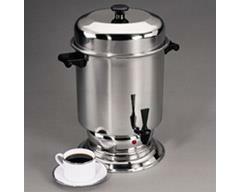 Brews approximately 50 cups in 30-40 minutes. Must be plugged directly into the wall socket...DO NOT use an extension cord. Uses 3 1/2 cups of grounds when the pot is filled to the 55 cup mark. * Please call us with any questions about our coffee maker 55 cup capacity in Oak Grove MO, Blue Springs MO, Independence MO, Lexington MO, Odessa MO, Independence MO and Western Missouri.